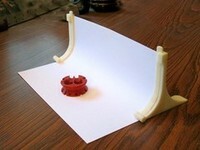 Modular Air brush paint holder and tray by kodakid707 is licensed under the Creative Commons - Attribution license. I recently purchased my first airbrush, and with it a variety of paint. I soon realized that I would need a place to keep each bottle and organized. I decided to design a storage solution that would allow me to expand as I purchased more paint. This is a modular storage system for a compact solution that can grow as big as needed. I figured most work benches are longer than they are wide, so this design can be expanded left and right as needed. 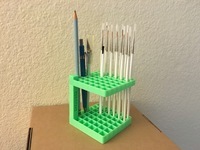 This design also includes a tray to hold various tools. I am still very new to airbrushing, comments and critiques are very much welcome! Say thanks by giving kodakid707 a tip and help them continue to share amazing Things with the Thingiverse community. We're sure kodakid707 would love a Tip, but unfortunately they have not setup their accounts to receive them yet.